Q. Who is eligible for the home-delivered program? A. A person must live in Lawrence, be homebound and have a special dietary need. 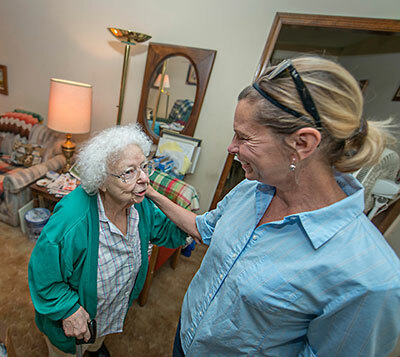 Any person who is unable to leave their home without assistance qualifies as homebound. Participants over 60 must have a doctor ordered special diet need. Participants under 60 must have a special dietary need which can either be a doctor ordered diet or that they are unable to prepare their own meals, shop etc. Q. When are Meals on Wheels delivered to the homes? A. The meals are delivered Monday through Friday, between 11:00 – 12:30. Q. 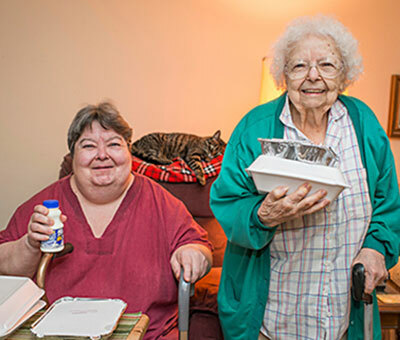 How much does it cost to receive Meals on Wheels? A. No one is ever turned away due to their inability to pay. Clients pay anywhere from $0 to $4.50 per meal. Financial assistance is available. Q. Where are the meals prepared? A. The meals are purchased from Lawrence Memorial Hospital. They are prepared according to each specific diet order, under the supervision of an LMH dietician. Q. Who delivers the meals? A. The agency depends on volunteers to deliver the meals. Q. What is the cost of the meals? A. Each meal provided currently costs the agency $7-$8. Q. Who pays for the meals? A. Clients contribute according to ability, and the agency receives funding from the Jayhawk Area Agency on Aging, Kansas Department on Aging, various grants, foundations and private contributions. See the list of donors on our About Us tab. Q. Who governs the agency? How large is the staff? A. A 7 – 9 member board of directors governs the agency. The staff consists of three part-time employees: an Executive Director and two Program Assistants. Additionally, we have an Americorps member currently serving as our Direct Client Liaison.